Considered by many to be one of the most productive sluggers (and finest gentlemen) in MLB history, James Howard “Big Jim” Thome has spent the last 18 MLB seasons doing one thing better than perhaps any other player during the same span: quietly making opposing pitchers very nervous. Now, after more than three seasons as White Sox DH, where he has been steadily stomping up the all-time home run list (he recently passed Reggie Jackson) Thome has taken his 564 career home runs (12th spot), .560 slugging percentage, and a .406 on-base percentage to the City of Angels…where he is reunited with long time friend, teammate and fellow 500 Home Run Club® member Manny Ramirez. Editor’s Note: Only three times in history have two active members of The 500 Home Run Club® played together on the same team – and Thome was in two of those three pairings. Big Jim and Ken Griffey, Jr. shared the Chicago White Sox locker room during the second half of the 2008 season, and now he is reunited with Manny Ramirez in L.A. The first duo to join forces for a team after surpassing the 500 career home run mark were the un-retired Sammy Sosa and Rafael Palmeiro who played together for the 2005 Orioles. Kenny Williams, Chicago’s south side GM said “The man [Thome] has always expressed to me that personal accolades are not as important as ultimately getting a [championship] ring, so ... he made a decision [to waive his no-trade clause], and I told him ... I would support him in anything he wanted to do and I let him go." Of course, becoming only the seventh player in MLB history to his 600 or more long balls wouldn’t be too bad either. Well he’s definitely in the right place to take a shot at achieving the first of his two remaining career goals. 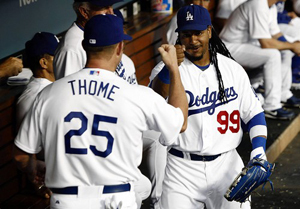 The Dodgers are one of the hottest teams in baseball. 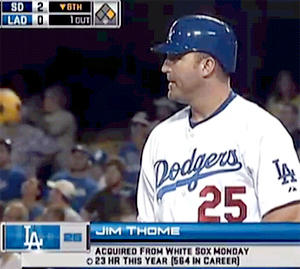 In his first plate appearance since being acquired from The Chicago White Sox on August 31st, Thome acknowledged the standing ovation of the suddenly very friendly Los Angeles crowd and promptly hit a laser beam single in his first at-bat for his new team, The LA Dodgers. So what’s in the future for “Big Jim”?